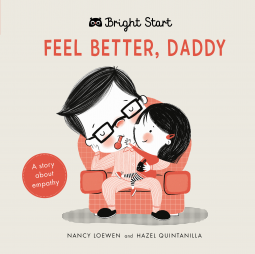 You will feel better too: Feel Better, Daddy – Joyce's mystery and fiction book reviews with some non-fiction too! I love this book! It is so sweet and caring as it demonstrates empathy without being preachy. Daddy is sick and his daughter wants to make him feel better. The child who listens to this picture book will see all that she tries..does daddy feel better in the end? Is he ready to be the usual daddy again? Adults may know but children will love finding out. The illustrations as you can see from the cover are simple yet very appealing. I enjoyed looking at the little girl, her dad and the dog. Many thanks to NetGalley and the publisher for a lovely book about what happens when a parent is sick and how a child might help. The opinions are my own.